After being in private beta for the last three months, Playyoo is opening its doors for everyone this morning. The site is aimed at casual gamers who like playing games on their mobile phones. Like Kongregate, game developers can show off their wares and interact directly with the people playing them. Better yet, anyone without programming knowledge can use Playyoo’s WYSIWYG game creator tool to create one of six game presets of simple games like pairs, tic tac toe, snake, and ping-pong. While the amount of customizations on these gaming presets is fairly limited, the titles uploaded by real game developers tend to have a little more depth. Developers with existing projects can simply port them over with a Playyoo-supplied template for Flash 8 Pro or CS3. In terms of cost, if users find a game they like, they can download it to their mobile phones free of charge. The entire service is run by advertising, which shows up both on the site and on the games when you start them up. What I really like about Playyoo is that it supplies each user with a customized “game stream” that can be tweaked similar to Facebook’s newsfeed so that certain game genres show up more or less than others (get a peek at this after the jump). It makes it easy to discover new content as it comes in. Likewise, Playyoo users can send recommendations to one another if they come across something cool or worth playing. Playyoo currently supports a pretty massive variety of phones. It’s also nice enough to let you know how many games out of the entire library your phone can handle, along with providing a bandwidth limiter you can set to automatically cut you off of after burning through a set limit of data. While the graphics of the titles may not blow your socks off (like the upcoming Vollee service) you can’t beat the price, and the potential for the game creator Web app is promising for folks like me with little to no coding skills. More screens after the jump. Looks like MySpace is working on a gaming portal. The URL for this page is games.myspace.com. This could be a hit if the games are less like the ones you can find on other casual game destinations (Yahoo Games, for example) and more like Facebook app games with a stronger social component to them. 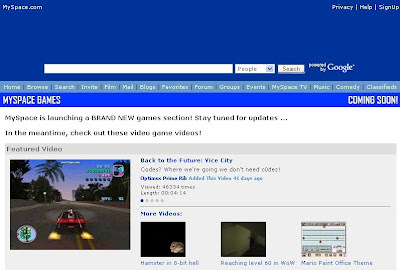 Social advergames on MySpace would also be an interesting ad channel. There are plenty of Flash games out there for MySpace users to embed already, but I haven’t seen any that let you play with your friends. Oh, and to the readers of this blog: I just got back from a vacation with no internet hook-up, but now we are back to our regular programming.